The grind continues! Playing against Big Ben's Denny ghost fleet. Was a pretty standard list, I think I've played it more times than ben has. This was at Total Escape game, 75 points on Standoff. I'm testing both the Heretic and the Dreamer into ghost fleet, so tonight I decided to drop the Dreamer. This scenario is super live, I've got to weather him getting up early and fight back for a grindy/ugly attrition win. I'm going to run the Cage Rager and Skin & Moans in pairs around the corners where I can hopefully contest the circular and the rectangular zones. The rattler will be my second line hitting piece the hopefully clean up after the Heavies take the charge. The frightmare can't die. I need the animus to help keep Denny 1 honest on her feat turn. We roll and ghost fleet wins (I HATE the single die mechanic for first turn, but more on that another time), they elect to go first. I take the side with less rough terrain in my way to the middle of the board. I take Accursed and Pandemonium as my Arcana. I'm hoping that with the two Cage Ragers I don't need Ruin. In addition I have Eilish to drop upkeeps once they are out there. I want Accursed since he has a full unit of Blackbanes. Here we go! Ben slants pretty hard. 3 units of pirates to my right and the blackbanes on the left. Wraith Engine dead center and flanking stalkers. I setup my pair Cage Rager/Skin & Moans pair on each side. The Death Knell will go up the middle and the dreamer will just barely leave killbox for most of this game. The Dreadrots go wide toward the circular zone without rough terrain. I deploy the Rattler and Frightmare across from as many pirates as I can. He runs, couple ghost walks and more runs. Crap is in my face. I shuffle/run up. I drop mirage on the center Cage Rager, and artifice for the right Skin & Moans. The Frightmare has a shot on the stalker, but misses even with a reroll. He goes all in. He allocates 2 to the Stalker I missed with a shot hoping it will kill the Frightmare. Wraith Engine is jammed into my face. 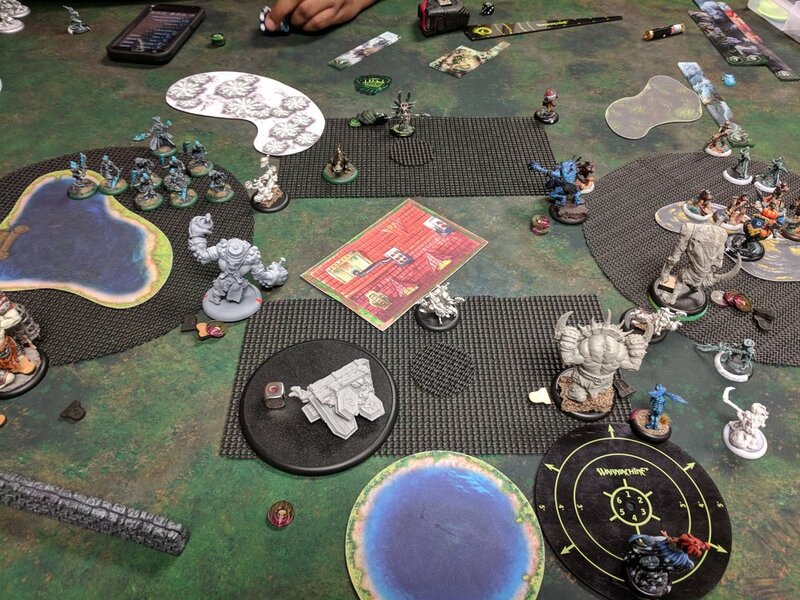 Denny 1 advances, feats (not catching the dreamer or Frightmare) and venoms forcing 2 toughs on Rots, killing 1 and kills a Gremlin swarm. I trump. Okay I know it's a weird move but I don't think it is. Denny is in range of an apparition, move 2 arcnode. She spent 2 focus on the Stalker, 2 on the Venom, and 2 boosting so she's camping 1. She's going to be knocked down, I can See in the Dark for 1 and hit her with 2 pow 12 Abyssal Gates. If the Frightmare lives through the stalker (math says he will but who knows what aspects will be Grievously removed) that's a booster pow 13 hit as well. I'm not trying to get a gotch win, so at this point I explain my plan to Ben and tell him to surround Denny with Pirates to block LOS. He obliges. Stalker goes in and somehow doesn't drop an aspect on the Frightmare. Blackbanes charge my cage rager and the last stalker comes in for some additional hits. I think I've won the game. Denny feating and not using it to go up hugely in scenario is just fine with me. Dreamer goes incorporeal. Eilish puppet strings the Dreamer. Abyssal gate the Wraith Engine to me, and Abyssal gate the Arcnode closer to the Skin&Moans. Left gremlin swarms and the Skin & Moans dispatch the Stalker. Cage Rager gets himself 2 corpses. Right Cage Rager hits the WE a few times, casts his animus on the Skin & Moans. Skin & Moans finishes it off spawning "Mittens" and kills the Arcnode as well. Mittens runs, bulldozes and contests. I can't emphasize how HUGE it is to be able to have models in Denny'1s control on her feat turn that can run. This is the main reason I think the Dreamer might end up edging out the Heretic as my go to ghost fleet drop. Gremlin Swarm, and a combination of decent dice, a Dreadrot, and the Frightmare leave the Stalker on 1 box in movement. No one scores. We knew we'd get down in scenario, no need to panic. Dreamer casts Artifice, and Manifest Destiny. Right Rager trampes and RFP's the "middle" pirates unit leader. He kills 7 total pirates. The Rattler proceeds to destroy 1.5 units of pirates. I RFP the unit leader for Brother Mouse, who then runs to the back corner to contest. The Rattler doesn't quite make it into the rectangular zone, but does smack Rengrave for insult to injury. On the left I send a Cage Rager to kill his pistol wraith, and the Skin & Moans shuffles up to contest as well. 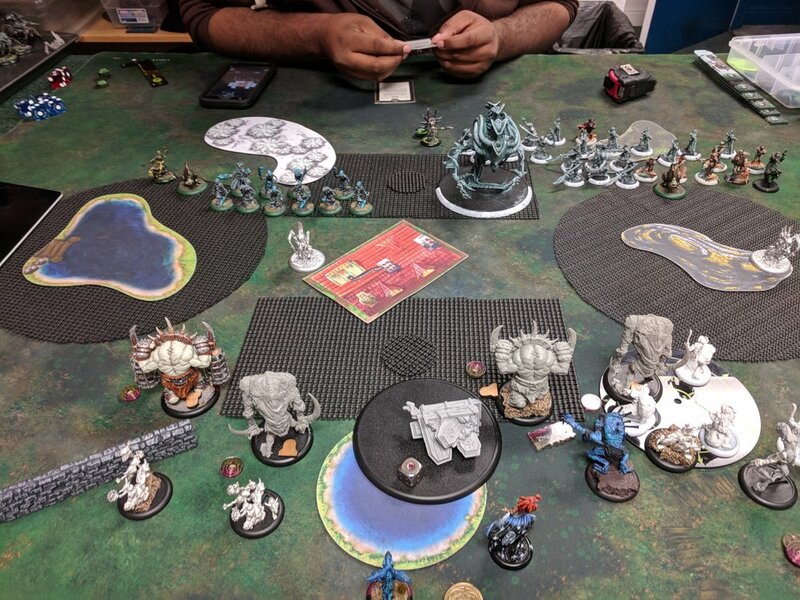 I score to 3-1 Cryx advantage. He goes in the tank for a long time. He needs 3 points more than me this turn to win. He decides he can't clear left, he goes to clear his own, the right zone and my objective for 3. His Pirates activate and fail to kill the Skin & Moans on the charge and he forfeits. I think he still had game but I understood why he tapped there. 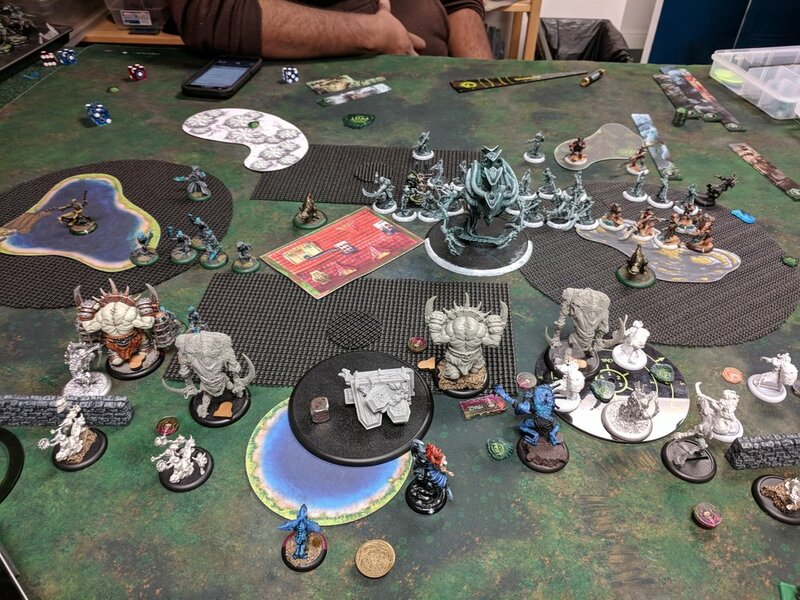 Even with a really good turn in Denny 1's feat I end up down 3-0 on scenario. God that feat is strong. A few things go Ben's way and despite me being massively up on attrition I end up losing on scenario. Ghost Fleet has such an amazing tool box and on the live Scenario missions I almost always feel like I'll be the underdog. What have you guys been dropping into Ghost Fleet? As far as Arcana I'm really trying to test them all. I still think I want ruin all the time with the Dreamer. What have you guys been using?